Dr Vassos Lyssarides is known as a man of vision and an optimist with a belief in human nature. He is the founder of the Socialist Party of Cyprus was its president for 33 years and is now the honorary president. He was, and is an ideologist who has the gift of looking at life realistically and yet still harbours a vision. > and integrity of his country or to the detriment of both Greek and Turkish Cypriot communities. His contribution to political life, not only of this island but also internationally is far-reaching. He served as President of the Committee for Peace in Cyprus from which he resigned when the Soviet troops invaded Czechoslovakia. He was Vice-President of the Afro-Asian People's Solidarity Organisation; he was at the head of ICSA (International Committee in Solidarity with Southern Africa) which worked vigorously for the release of Nelson Mandela. Dr Lyssarides has also helped freedom fighters from Africa and throughout his political career has met all of the African liberation leaders, either in a personal capacity or as General Secretary of ICSA which worked against Apartheid and for Mandela's release. He was deeply involved in the EOKA struggle in Cyprus against Colonial Britain from 1955 to 59 and also treated fighters and offered them refuge in his Nicosia clinic. At the time, Dr Lyssarides had also established the movement of leftwing patriots and was considered a political district officer. At the London Conference later he acted as a representative of EOKA and voted against the Zurich - London agreements which ended the guerrilla-led rebellion in Cyprus. He believed that the arrangement was not functional as it was based on racial distinction and was most divisive. Dr Vassos Lyssarides was elected to the Cyprus House of Representatives in 1960 upon independence and has been a member to the House ever since. He was also the leader of the Popular army during the 1963-64 intercommunal upheavals instigated by Turkey. In 1969 he founded EDEK, the Socialist political party of Cyprus and was its President until 2002. He is now the party's honorary president and is still active in politics. It was the EDEK supporters led by Dr Lyssarides who faced and blocked an attempted coup in 1972, and throughout the early seventies he actively participated in the struggle of the Greek people against the Junta. In Cyprus, under his leadership, EDEK was the main resistance against Junta infiltration. He also co-operated with the mainland Greek resistance groups, mainly P.A.K. (Papandreou). Then, in 1974, Dr Lyssarides led the struggle of the Cypriot people against the coup carried out jointly by the mainland Greek Junta and the local EOKA B. The Turkish invasion and occupation of Cyprus followed. On 30th August, 1974, an attempt was made against Dr Lyssarides' life during which the party's youth leader, Doros Loizou and a passerby were killed. The aim of the attack against Dr Lyssarides was to silence his repeated calls for the return of President Makarios and the end of the post-coup status. Dr Lyssarides was also an obstacle for the materialization of the then US Secretary of State Kissinger's plans. Dr Lyssarides served as President of the House of Representatives from 1985 to 1991. He was also president of the Cyprus Medical Association, Hippocrates and is now its honorary president. Gunmen from EOKA B opened fire and wounded Dr Lyssarides while enroute to his Nicosia office on 30th August 1974 following an earlier Junta - backed coup d' etat against the Cyprus government. The doctor was the main fighter against the Junta and after the Turkish invasion of northern Cyprus in July, 1974, he continued to work for the restoration of the elected President of Cyprus, Makarios. The President had taken refuge in London following the coup after EOKA B and Junta members attacked the Presidential Palace with the intention of assassinating Makarios. During the later attempt against Dr Lyssarides' life, the youth leader of Dr Lyssarides' Socialist party, Doros Loizou was killed along with a passer-by. Doros Loizou's wife was also injured in the attempt. Dr Lyssarides first met Archbishop Makarios at the Pancyprian Gymnasium which they both attended, but in different classes. The negotiations over London-Zurich agreement was to further mark the close relationship between the two men. It was in London that Dr Lyssarides first treated the Archbishop and was to be his personal doctor until the end of President Makarios' life. Their frequent disagreements never marred their close friendship or the respect they had for each other. President of South Africa, Jacob Zuma, hosted a special National Orders ceremony and bestowed the Order of the Companions of O.R. Tambo to Dr Vasos Lyssarides on the 26th of October 2012. This was part of honouring the legacy of national hero and former ANC President Oliver Reginald Tambo, after whom the National Order is named. The orders were presented on the birth date of Mr Tambo during the International Solidarity Conference. 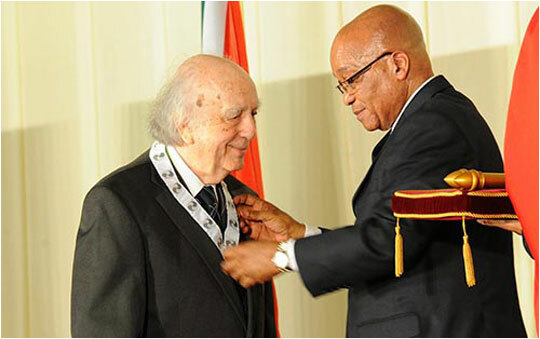 Dr Vasos Lyssarides was awarded this prestigious award for having played a significant part in the dismantling of apartheid in South Africa through lobbying the international community to take a stand against the oppression of South African people and for the release of Mandela. He was at the head of I.C.S.A. which was formed by AAPSO, Peace Movement and all the liberation movements of Africa. Κίνησης Κυπρίων Πολιτών στο Λονδίνο: " Η Αλήθεια για το σχέδιο Ανάν"
Last update: 27.06.2005 - lyssarides.com. All Copyrights Reserved.